In the Afterlight by Alexandra Bracken. Book 3 in The Darkest Minds Series. Review: Do you ever want to read a book that is fiction, with a lot of drama? 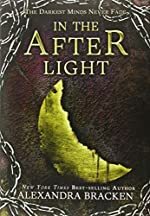 Well, with the book, In The Afterlight, The Darkest Minds Series Book 3 by Alexandra Bracken, you will be able to read a fiction book, with a lot of drama. Make sure you read the first two books though, because this book will be very confusing without the knowledge of the other books. This book is about a government attack on Los Angeles, with a lot of kids who travel north to regroup. Some kids are orphaned because of this attack, others are scarred for life, and most of them lost their parents and are relying on other kids to help them. There is a girl who is named Ruby, and the book is in her view. She is with a group called Children's League, and, when Children's League disbands, forms a group with an unlikely allegiance with Liam's brother, Cole. There are still thousands of Psi kids suffering, and getting abused in government "rehabilitation camps" all over the country. Their group is doing their best to try to free all of them to get them all back to their parents. Or put in communities where other adults will take care of the orphaned children 'till they are old enough to take care of themselves. But not everyone is supportive of the plan Ruby and Cole make and craft for months, to free all of the camps. The age group that is best for In The Afterlight, is ages 12 years and up. Because of the violence, adult scenes, and swear words in this book, this book is best for Early Junior High, up to any age. This book is not for young children. In The Afterlight is fiction, and is sometimes confusing, because they use code words for different groups they make up. This book is 535 pages long so, for faster readers, it might only take a week, but if you are a slow reader that barely reads, it could vary from two weeks, to seven or eight weeks even. The format of the front of the plastic cover on the book would probably be appealing to most Junior High students, if you like to read. Overall, the topic, and most probably the format, would appeal to many readers. We would like to thank Disney-Hyperion Books for providing a copy of In the Afterlight for this review. Have you read In the Afterlight? How would you rate it?